After Come and Hug Me (all the hammer murdering remember?) I needed something a little more chill, and this ended up being the perfect one! Like, probably the most refreshing drama ever. It's a simple story, which in kdramas is quite rare, about a guy and girl falling in love. Yes. That's pretty much it. The girl has a family that is giving her grief, so the whole conflict is.... is she strong enough to stand up to them and finally, once and for all, be happy? Oh, and there's the little conflict that she is much older than him. We call that a noona romance and it's awesome. She is a CEO of hotel chain and is planing on opening up a new hotel in Cuba. So she is there on a business trip. He is "just and ordinary guy" traveling around, spending the last few days of his 20s on a trip. They have a chance encounter, and spend a lovely (very tame) evening together. Eating, dancing, talking. She has been pic-pocketed and has no money, so he is scraping his pennies together to pay for their fun things. He has no idea who she is. At the end, they plan to meet for breakfast, but of course it doesn't work out and they go back to Korea thinking that's it. Well, and so he is getting a job and is hired on... at the big hotel in Korea where she is the CEO. She is doing the welcome to the employees speech and their eyes meet across the crowded room. She freezes and he breaks into his beautiful smile. I kept expecting all the normal problems to happen, but since these guys were older, they didn't play games. They just talked things through. It's so refreshing. And the guy is so freaking honest and open, he just says what he's thinking and feeling. It's the best. I loved this character so much, and Park Bo Gum with his beautiful smile and clean look was perfect for the role. The cinematography is great too. They make Cuba look like the most romantic place to go! Who knew? CUBA!!! There was no silly stuff like sometimes happens in kdramas, no over the top acting, no crazy antics, no sad backstories (except for her marriage and life, which was not really a back story as it was still currently happening). But we still had the quirky and fun side characters, which completes the whole picture. I'm not wanting to figure out what to watch next after this one. I guess I'll read for a bit! LOL! 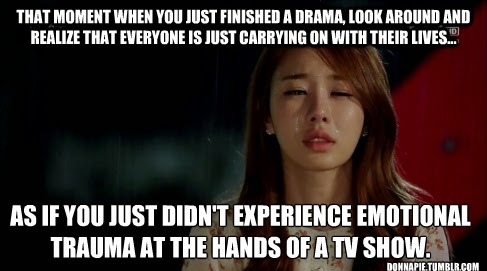 Where do you watch the kdramas? I was thinking of trying one.... we use netflix, amazon and a slew of other stuff available on roku, but I couldn't find this title on any of them. I watch mine on an app called Viki... there was another one but it died. :( Netflix does have a lot too, but I looked and I've only seen a few of them! Beating Again is one that I reviewed a while back, you might like that for a first go around. Viki does use Roku, so if you decide to try that, you can easily get it on your TV. It is free, with ads. Let me know if you try something! Yeah, we have Roku too. I'll see if I can find something, thanks.